Our new line of Fundamentals papers just became available, and we couldn’t wait another day to show them off! Just like their name suggests, these papers are fundamental for any scrapbooker. With versatile, monochromatic patterns in our exclusive colors, they’re perfect to pair with cardstocks and other patterned papers. Once you try them out for yourself, you won’t be able to live without them! Today we’re showcasing our Uptown Fundamentals, which feature neutral colors and special materials, like foil and vellum, to give them a little something extra. Look at the elegant feel that the Uptown Fundamentals bring to this layout with that beautiful script font, the gold foil polka-dots, and the striped vellum. Because they feature neutral colors, we could create our own color scheme using just a couple pieces of cardstock. Here we have totally different cardstock colors also paired with the Uptown Fundamentals for a completely different look! 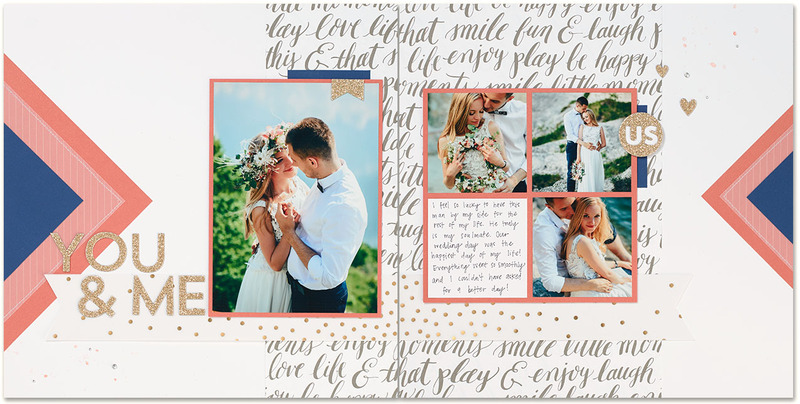 Those adorable glitter titles and other accents on these layouts are part of our You & Me Complements, designed to coordinate with the Uptown Fundamentals. We even have an Uptown ribbon pack to give you even more mixing and matching options. The Uptown Fundamentals are just one of the newest paper collections we’ve released today—but there is plenty more where it came from! Head on over to closetomyheart.com to check out all our new products. There, you can also learn how to get the Uptown Fundamentals for free!